A new Metabolic Balancer App to replace the DietWell App to help people living with Metabolic disorders to feel balanced, feel better with key functionality to create recipes, track phe and protein intake, share information with friends and learn about Cambrooke products and much more. In addition to all the features and user interface enhancements, with this new release we have rearranged recipes, meals ingredients, food items and their classification to make the new app more relevant, efficient and organized. Metabolic Balancer – is designed to assist in the dietary management of Phenylketonuria (PKU) and other inborn errors of protein metabolism where tracking exact protein is essential in the management of a specific metabolic disorder. This iPhone app guides you through your meals, snacks, and formula intake by offering phenylalanine (phe), dietary protein, formula protein equivalent (P.E. ), and calorie information for over 7500 food items, specially manufactured low protein food products, metabolic formula products, Cambrooke recipes and meals, along with your Kuvan® intake, blood levels and wellness - all at the touch of your fingertips. 1) Improve Dietary Compliance- learn about the phe content of your food in order to make better choices. Metabolic Balancer provides a quick reference to more than 7500 food items. Know what each portion or recipe actually contains. Know when you need to adjust your dietary phe intake. Save your favorite foods to Favorites or add new items, recipes and meals. 2) Prepare Diet Log and export it via email in preparation for Clinic Visit. You can now easily record your dietary protein, supplemental protein, and Kuvan® intake along with your blood levels and wellness using this handy iPhone app. Many U.S. metabolic clinics recommend 3-5 days of dietary records before the clinic visit. Metabolic Balancer app can help you better understand how dietary compliance correlates to your overall feeling “wellness”. • Over 7500 USDA and manufacturers' product data. Includes data on many specialty low protein food items and formula. • Log data for multiple users. • Save your frequently used food items or recipes to Favorites. • Add new food items, recipes or meals. • Share custom items, recipes and meals with friends. • Track of your Kuvan® intake, blood levels and daily wellness. • Monitor your daily goals with the graphing feature. • Review, edit, and export to email (by date range) daily log entries by user. • Enter quantities in three convenient units: gram, ounce, or serving size. • All data is contained within the app. No Wi-Fi connection is needed except when downloading updates or exporting logs via email. The Metabolic Diet App Suite: Metabolic Diet Tracking on the Go! Lifelong medical nutrition therapy (MNT) is a key part of medical therapy for many inherited amino- and organic acidopathies. But there is a lack of metabolic disorder specific diet intake tracking and meal planning resources. Many individuals living with metabolic disorders experience difficulties following their daily metabolic diet goals. 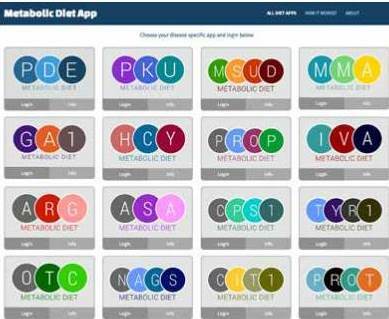 The Metabolic Diet App Suite is a free, web-based metabolic diet tracking tool developed to help people living with metabolic disorders track and plan their daily diets. It was created with input from biochemical geneticists, metabolic dietitians, metabolic patient caregivers, and application developers for use on both mobile devices and desktop computers (http://www.metabolicdietapp.org). General disorder information is provided for fifteen individual metabolic disorders for example ‘GA1’ (glutaric acidemia), ‘IVA’ (isovaleric acidemia), ‘MMA’ (methylmalonic acidemia), ‘PROP’ (propionic acidemia), as well as a general protein tracker ‘PROT’. Food nutrient content is based on the MetabolicPro™ program food database, compiled by the Genetic Metabolic Dietitians International (GMDI) Technology committee. Each Diet App offers functions such as: secured personal user login/password, user instructions, goal setting, daily intake tracking, food content checks, adding foods and homemade recipes, exportable daily food diary log (update your doctor and dietitian), and developer feedback. Individuals can start by going to the website and creating an account and diet profile, no downloading required. The website provides a user guide: ‘How it works?’ with answers to frequently asked questions (FAQs) such as how to recover forgotten password and usernames and contacting the developers. Initial pilot tester feedback was positive and suggestions used to further improve the App suite. This project was funded by the British Columbia Children’s Hospital Foundation (Treatable Intellectual Disability Endeavor in British Columbia, www.tidebc.org, 1st Collaborative Area of Innovation) and the Rare Diseases Foundation (Vancouver, Canada). The Metabolic Diet App Suite is intended as a patient and caregiver support tool. They do not replace the GMDI Metabolic Pro™ diet analysis program or health care professional advice. We hope that this tool helps ease the daily challenge of metabolic diet tracking and meal planning for individuals living with protein or amino- or organic acid restricted metabolic nutrition therapies. Ho G, Ueda, K, Houben RFA, Joa J, Giezen A, Cheng, B, van Karnebeek CDM. Metabolic Diet App Suite for inborn errors of amino acid metabolism. Molecular Genetics and Metabolism. 2016 Mar;117(3):322-7. What's the Law for Formula Coverage in Your State? Low in Protein, BIG in Taste! Product information, recipes and online ordering are conveniently available at MySpecialDiet.com. Free shipping is available on orders over $25.